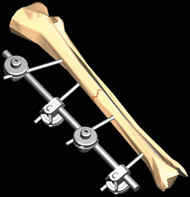 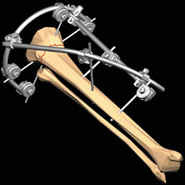 External skeletal fixation is a new technology for treating fracture, deformity of bone & joint and limb discrepancy. 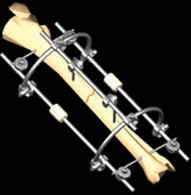 Since the pins are inserted away from the trauma area, the blood circulation to the fracture is greatly maintained. 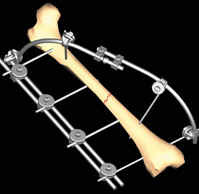 During external fixation, the patient can perform functional exercise early and hence have speedy recovery. 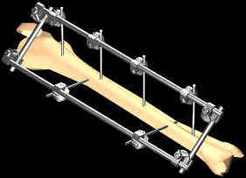 The relation and mode of action between different parts of the external fixator is called Structure, it is the mechanical frame ( not including the connection to the bone) resulted from the conjunction between the external device and pins. 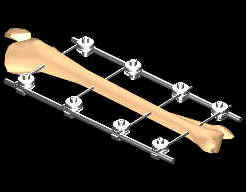 External fixation is a kind of hyper space structure and is divided into simple structure and complicated structure.